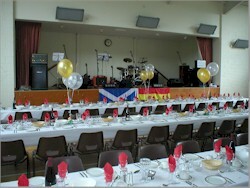 Crianlarich Village Hall is a modern, purpose built village hall in the centre of Crianlarich. a large main hall with a stage. This hall is marked out as a badminton court, and also features a high ceiling. 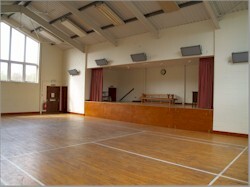 This hall is perfect for performances, active games and parties. a smaller committee room ideal for meetings and small exhibitions. additionally, there is a spacious foyer, a well fitted kitchen ample toilet facilities, and a shower. Free WiFi is also available throughout the building. Please ask for access codes at the time of booking. The hall was built in 1991, to replace the old village hall (on the same site), which was no longer fit for purpose. Local people worked tirelessly over several years to raise the money required (this was in the days before lottery funding was available). The hall has recently been refurbished, including the installation of new heating, new lighting to the main hall and a new kitchen. 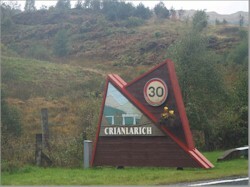 Crianlarich Village Hall is owned and run by the people of Crianlarich. The hall relies on income from lettings throughout the year in order to meet its running costs. The income from letting is supplemented by money raised from annual fundraising events, and a small amount of financial support received from Stirling Council. A voluntary management committee is elected at an AGM (held in April each year). For groups looking for a meeting venue in West Central Scotland, Crianlarich is ideally located. The village is easily accessed by road (at the junction of the main A82 / A85 trunk roads), and also well served by public transport from Glasgow, Oban and Fort William. By road, Crianlarich is approximately 1 hours drive from Glasgow, Oban and Fort William, and approximately 90 minutes from Edinburgh and Perth.